Female boxing has only recently been brought in to the Olympic games with the ladies being allowed to compete from 2012 onwards. Despite how recent that is the fighters themselves aren't new to the sport and many of Japan's top female fighters, such as Naoki Fujioka and Momo Koseki have been fighting for years as both professionals and amateurs. The next fighter Japanese fighter looking to make her move from the amateur ranks to the professional success is in action on Sunday in what we believe to be the only major Asian card of the day. The fighter in question is Yoshikawa Nana (2-0) who competed in a host of amateur bouts in a long and distinguished career. She may not have managed to claim gold in major international competition but she still had an amateur career worth noting. 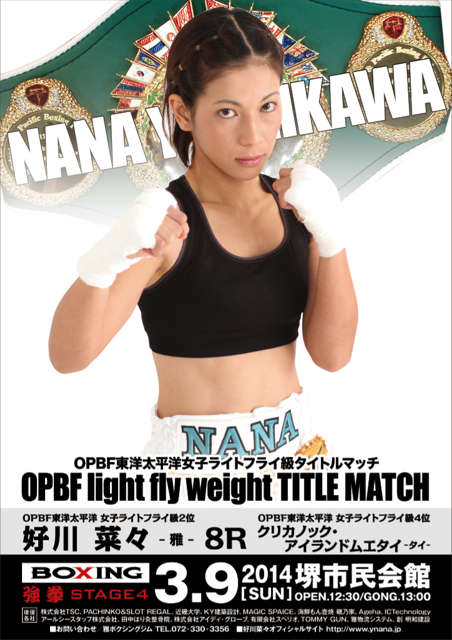 Nana will be attempting to claim her first professional title on Sunday as she battles Thailand's Krikanok Islandmuaythai (4-3-1, 2) for the OPBF female Light Flyweight title. The bout is the first major test for Nana since turning professional and a win could help her race towards a world title fight. Whilst Nana's fight is the one that has our interest it's actually one of nine bouts on the show and is only the chief support bout. The actual main event is a non-title fight between Japanese Featherweight contender Shingo Kawamura (8-1, 3) and the heavy-handed Moriizumi Masami (5-2, 4). Although going in to this bout Kawamura is on an 8 fight winning streak and Masami is on a 2 fight losing streak it'd not be a surprise for this to be a very competitive match up between relatively well matched fighters.